After a wild and windy day on the water on day two of the 2009 Skandia Sail For Gold Regatta, some sort of pecking order is developing in the 470 fleets. 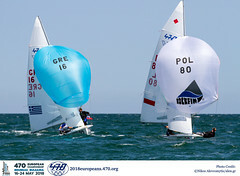 In the 470 Mens’ fleet, Australians Mathew Belcher and Malcolm Page continued their impressive performance and their 1,1,1,2 scoreline from the first two days’ of racing sees them hold a four-point lead at the top of the table. In second place is Britain’s Nic Aisher and Elliot Willis whose 3,2,2,2 keeps the pressure firmly on the leaders. The final podium position at this stage is occupied by another GBR pairing in the form of Luke Patience and Stuart Bithell who are some eight points off second. Despite the increased wind strength out on the water today which saw gusts of up to thirty five knots at times, Belcher and Page said that the sea conditions were not too dissimilar to yesterday. ‘Today was still quite shifty’ commented Page, "But less so than yesterday. We got the chance to sail longer legs upwind today whereas on Monday you had to tack on every little shift." 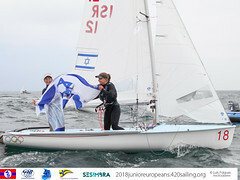 Commenting on their continued strong performance, after their silver medal at the 470 Worlds last month in Rungsted, Denmar, Patience said, "We’re really pleased. We’re yet to pick up a discard – touch wood – so we’re just clocking in the good results while we can. The wind does suit us as a team so it’s nice to be able punch a bit of risk in there and get some good ones." New Zealand maintained their grip on the Women’s 470 events. Two second places for Kiwis Jo Aleh and Olivia Powrie gives them a massive 17 point advantage in the women’s fleet, over Yuka Yoshisako and Noriko Okuma (JPN) in second. 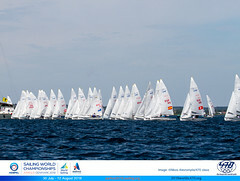 Despite their success to date, Aleh refused to be drawn on the pair’s prospects at the Skandia Sail for Gold Regatta. "We’re just taking it as it comes, but it’s been going pretty well so far," she said. "Most of the top-10 in the world are here, so it’s a good competition." The recently formed Skandia Team GBR 470 crew of Pippa Wilson and Saskia Clark relished the opportunity to race together in ‘serious wind’ and climbed to third overall with a third and a seventh today. "We haven’t done any sailing together in serious wind. For us every day is a big learner, and so far, so good," said Wilson. "It’s been great to race at Weymouth, the event has been awesome so far," she added.